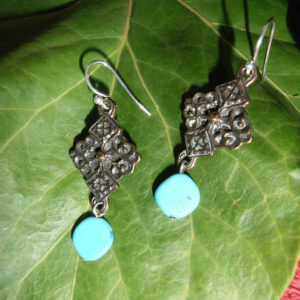 Cast Bronze and Sterling Silver Celtic Heart Style Earrings. This style features waves of greenish-blue Aquamarine. We love Celtic Art. Classic Celtic styles, modern Celtic styles, Celtic Kitsch, Most of all we love the forgotten Ancient Celtic Art. Celtic Art from a time before the illustrated manuscripts. The wild, bold, amazingly sophisticated art of the fierce early Celts who battled the Romans -and each other- and laid the foundations of an unkillable artistic tradition. 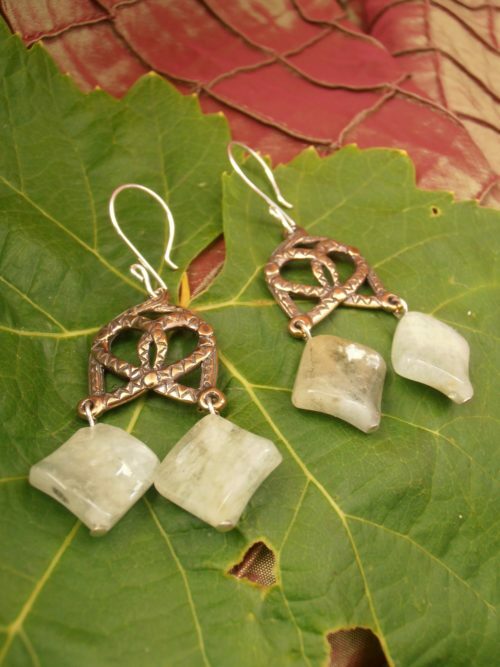 These earrings are inspired by the art of those early Ancient Celts. The Celts who fought under Vercingetorix and the British Queen, Boudicca. Wild, free, full of heart. 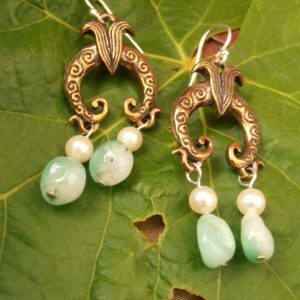 Cast out of Bronze -the early Celts loved Bronze- finished with sterling silver wires -your ears deserve nothing less- and garnished with “waves” of included greenish-blue Aquamarine. A suitable Celtic ornament for a modern Celtic woman.